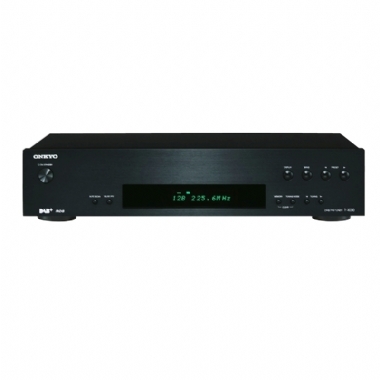 The Onkyo T-4030 DAB, DAB+ and FM HiFi Tuner - With digital radio, you not only get an impressively wide selection of stations to choose from, you can also enjoy clearer reception and the convenience of 40 preset channels at the touch of a button. Designed for enthusiasts who know a quality component when they see it, the T-4030 ensures that radio signals are kept free from interference—from the time they’re picked up by the supplied antennas right through to the amplification stage. Owners can choose to employ the tuner’s digital outputs to send DAB+, DAB, and FM Digital signals to the pre-amp for processing, or use the onboard Wolfson® DAC to create a pristine analog signal for your power amplifier. Either way, you can be assured of a deeper, clearer, and more expansive sound thanks to the audiophile-grade capacitor and tough anti-resonant construction. The tuner is RI-compatible to enable control of the device using your main system remote, and is packed with intelligent features to smooth your path to a world of talk radio, news, and music.